The Morning Star shines its light upon you and you alone -- illuminating the way, allowing you to fulfill the brilliant future that destiny has planned for you. The Morning Star is the eternal jewel of the night. It is your personal star. As the 18th century poet, Jeffrey Banning, said: "Whatever road I take, the Morning Star is with me. This is my guiding star which points the way. Its light is aimed in but one direction -- directly at me." It is believed that the person who wears the Guiding Star shall forevermore be in its stewardship. That once you possess the Morning Star, hidden forces will be at your side -- helping you, guiding you, working in your behalf. 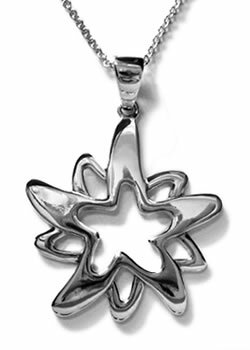 The Morning Star is a high polished silver pendant, complete with silver chain.